On more than one occasion, while out and about taking photographs, (mainly in London) I’ve been stopped for having a camera round my neck and looking like I might be about to take a picture. Yup, that’s all it seems to take now-a-days to raise the suspicions of some underpaid private security guard. Just be out and about minding your own photographic business, perhaps dangerously close to the threshold of some crappy shopping centre and as quick as it takes for a CCTV camera to rotate.. There they are, trying to enforce some imaginary law. Normally I flash my press pass and tell them I know my rights. Sometimes I am feeling a little more confrontational and ask exactly what law it is they think they are enforcing? On one occasion a confused security guard told me it was one of the prevention of terrorism laws. 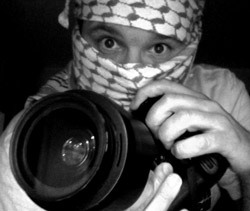 The conversation then swung round to me asking.. “Do I look like a terrorist?? I am not sure when all this started.. Perhaps it was just after 9/11 when everyones hightened level of paranoia needed to be justified by inventing some extra imaginary threats. Most of the time, the least that happens is I’m looked at in a “I am watching you” kind of way. This is with a Mediterranean complexion, who knows what would happen if i wanted to go out with a camera and I was slightly darker skinned! You may well have seen them yourselves, but once in a while I pass by a shop window and catch sight of those scarily Orwellian anti-terrorism posters asking YOU to be vigilant and to keep an eye out for people who use more than one mobile phone, or people who travel alot.. or who take photographs in a public place. This kind of fear-mongering really pisses me off and in the past I have gone into the shop and asked if I could have the poster. Part of me could not believe the ridiculousness of it all and seemed to be wanting to gather these posters as evidence of crimes against common sense. Are the general public really so small minded as to report one another for doing normal everyday things? Anyway it seems like I needn’t have bothered collecting these posters as most seem to be available. With that reassurance in mind, read the article to learn that perhaps ‘movie plot‘ threats are being concocted to have some kind of psychological grip on our already fear laden minds. We really must make a point of fighting for our photographic rights.. If you are out and about with your camera, be it video or stills, stick a printout of your rights in your bag and make a stand, just in case. This topic and others relating to our rights and what denotes a public space in todays day and age will be discussed at the social media picnic on the 25th of June. 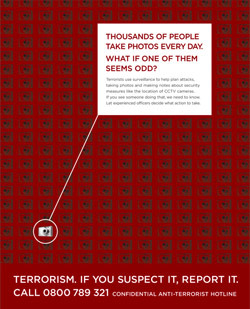 the irony is that i take pictures all the time with little interference and i probably look more like a terrorist than most. the secret? i have a very small camera. it’s a little casio that takes 10mb pictures. for some reason most of the attention is focused on those with larger cameras. i personally grew up with large cameras and understand the benefits. my dad had a mamiya. unfortunately, ignorant security gorillas tend to focus on large cameras as being some kind of gateway device to explosive devices. it really makes no sense at all. not only is it illogical it’s irrational. the irrational part? well of course the news, especially here in the states fans the flames of fear by always focusing on the threat around the corner. it’s a wonder we leave the house at all. Dude, great post and i love that last photo. I think this topic has been bubbling in your mind for a while and i’m glad you finally put it down on the blog. Great subject, but do you know anything about the law as it pertains to video capturing? I called and asked Home Depot if I could shoot part of a film for a school project in their store and they said they didn’t allow photography in their store. I know this “policy” is absolutely illegal pertaining to still photography and even random video capture, but I don’t know where the law stands on actually trying to film a scene in, say, a store if you’re doing it in a non-invasive manner (ie, not closing off aisles or telling people to shoo). I can only speak for the UK and here a store has every right to refuse photography and in fact even entry. It is not classed as a public place over here. It’s getting *very* dodgy here in the UK. You’ll be interested in watching this on Current TV. If I lived over on your side of the pond, I would cross off “our experienced officers” and replace it with “the party” on every one of those posters. I guess I’d probably be arrested pretty quickly too. Alain, what Documentally said holds true in the US as well. Stores are private property. What on Earth made you think that you had the right to do as you please there? There are certain limited exceptions for private property that act as throughways or as public fora… you’ll have a better shot in something like an open shopping mall or something. But if Best Buy tells you to get out and your don’t or to not take photos and you do… then YOU’RE the one breaking the law. nice article, thanks. Have any links on Canadian photographer’s rights? Goddamn government terrorizing the people like this. You can’t overdose on phones, it’s ok to have more than one. Hi Canucklehead, I don’t have them to hand but if there is some kind of press union there, they should be able to help you. Failing that. Try someone at the local newspaper. Yup, Sadly it is all for real. I’ve been living in London four years and the ever increasing number of cctv cameras in particular piss me off in a big way. It’s not like a cctv camera has ever jumped off a wall, put a cape on its back and rescued a maiden in distress. I lived on Brick Lane for a while and did this as a study: http://flickr.com/photos/keepingitfake/26410514/in/set-599567/ . Planning on seeing how it’s changed in the last few years soon. What I really want to add here though is a question. How from a civil liberties point of view do we, as UK voters and taxpayers challenge this at a local and national level? Why tell the store or make it obvious in any way? You can probably get better pictures anyway if people are not aware that a camera is at work in the area? If you can get a shot of the manager picking his nose make it poster size and hang them all over the neighborhood. In the U.S. property is in an altered state when a company advertises and invites the general public to come in by way of advertising. In general it remains private property but they sure as heck better watch what they do or a judge and jury might straighten them out and it may be expensive. One gimmick I like is if store security asks to see a receipt and you simply tell them that you charge fifty dollars to produce a receipt, It can get funny. The law does not require you to produce that receipt. And store employees frequently will gently grasp your upper arm to keep you from walking away. That really is assault. You can press it if you wish. Just be certain you really have paid for everything and really do have that receipt to show the cops when they show up. You’d better be right though, cuz its not nice to get people arrested like that. I am not familiar with UK laws, but in Canada and the US is is perfectly legal to prohibit photography on private property. You can take pictures to your heart’s content in public places, but stores, gov’t offices etc. can limit your freedom. They need to be up front about it, and they can never take your camera or film though. The poster is a bit scary, talk about 1984. At least in the UK you can argue with the Security guard or even a copper. The problem is that people are whipped up into a frenzy of fear and paranoia about perceived threats. I wonder how many people in the UK are walking around with a camera on them? Every mobile has one these days(nearly) and digital cameras are cheap as chips. It doesn’t help matters if the Home Secretary says it’s of to harass photographers, is it OK to harass people crossing the street because they might be jay-walking or people waiting at a bus stop because they might be loitering, oh well your honour he looked like a terrorist so we had to shoot him…..turns out he was an electrician from Brazil……. Christian, great post! Interesting topic, surreal poster, great pic at the end. Do you have an update from the social media picnic? I do have an update.. It’s in the shape of a podcast/blog i should have up in the next few days. Thanks for reading.. and yes, I would love to get over to SF.. I am saving up.. Slowly. “…There they are, trying to enforce some imaginary law” all these people that do try and stop you don’t know the laws or anything, it’s ridiculous yet I don’t know why they feel they are entitled to even question them. I’d suggest you alter your phrase “I know my rights” to “I know my rights, and you obviously don’t” or alternatively look at them shake you head in disbelief / disgust and walk on in silence. Also, I can’t imagine you shaking your head and walking away silently, but what else can you do mate.